If you're trying to build wealth, sharp market downturns are your worst enemy. And nowadays, they're happening far more often: in the last 18 years, the S&P 500 has experienced sixteen violent declines. Institutions and professional investors have mastered powerful hedging techniques for dramatically reducing the risks of market volatility. Now, you can do it, too--and you can't afford not to. In Buy and Hedge, two leading investment experts show how to apply hedging as part of a long-term program for growing and preserving your assets. CNBC Fast Money guest Jay Pestrichelli and seasoned financial industry veteran Wayne Ferbert show how to systematically protect yourself against violent downward moves while giving your portfolio maximum room to run in upward markets. The authors' techniques are easy to use, can be applied to most investment vehicles, and--once implemented--require surprisingly little "care and feeding." You'll discover how to take advantage of the hedge-building mechanisms built into low-cost index funds… invest in your ideas with confidence, because you've hedged the downside… systematically manage portfolios for risk as well as return… master and apply the "5 Iron Laws of Buy & Hedge"… use options to manage risk, not to create excess leverage… generate more dividends… effectively manage cash… and much more! I have invested for years, but the current market has left me discouraged. This timely book has shown me a new way to invest with built-in protection. Buy and Hedge, by Pestrichelli and Ferbert, is the perfect book for an investor trying to cope with the uncertainty and volatility in today's market. In a clear and engaging manner, the authors provide the reader with insight into investing and the common mistakes that can stand in the way of an investor's success. The book describes laws to be followed when investing, and insists that any successful investing must include both diversification and hedging. I like the author's use of real-life examples, and the clear way they build a case for including hedging in my investment strategy. The book explains techniques like collars and married puts, and goes on to explain how options are used as a mechanism for hedging. For me, options were always mysterious and something I avoided. These authors made options simple enough for me to understand, and showed me how to include them in my investment strategy. Concepts like spreads and probabilities are now tools I will use rather than avoid. 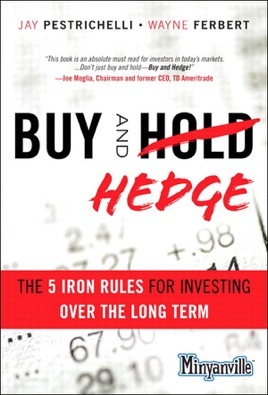 After reading this book, I'm definitely going to start hedging. It seems like a no brainer for this volatile market, and as the book says, "Volatility is Kryptonite". The point that really stuck with me were that investors never thing of risk first, if they even think of it at all. We always think of the reward first; its human nature. The book gives some easy and some more complicated risk metrics to consider; but don't be scared, they tell you how to use them. Although I've dabbled with Options before, I never realized how they can provide protection. I'm going out and buying protective puts TODAY! The cool thing about this book is they take away some of the mystery of options and help provide a game plan on what to consider and even some of the math to use when choosing a strike price. If you've ever wanted to protect your investments from an unpredictable market, get this book.